This Coat of Arms is from www.houseofnames.com. It varies quite a bit from the others below. This version of the Coat of Arms is from Halberts, which is reportedly out of business, after having many legal troubles with the U.S. Postmaster for selling fraudulent coats of arms. So we can take this with a little skepticism. It was obtained in 1972. The artwork is only in black and white, and not fine enough to make out the detail. However, they did provide a description from Burke's General Armory*, which might be considered a definitive source for this kind of information. Heraldic artists developed a unique language to describe coats of arms. The following is the description from Burke's General Armory*, and I added an explanation of that unique language after the description. *The General Armory (of England, Scotland, Wales and Ireland, Sir Bernard Burke - Ulster King of Arms - Heraldry Today, 1884, reprinted 1996. I have not seen an actual copy of this book. Ar on a mount vert, a buck trippant gu, attired or, in the mouth a trefoil slipped of the second, a chief az. charged with a castle having on each tower an obtuse spire surmounted by a weathercock, and on an arch over the curtain wall a cross flory all of the field. Ar. (argent=silver) on a mount (hill) vert (green), a buck (male deer) trippant (standing on 3 legs) gu (gules = red), attired or (gold), in the mouth a trefoil (a branch with 3 leaves) slipped (like the slip from a plant) of the second (small part), a chief (the strip across the uppermost part of a shiefd) az. (azure=blue) charged with a castle having on each tower an obtuse spire surmounted by a weathercock (weathervane), and on an arch over the curtain wall a cross flory (=fleury, meaning fleur-de-lis) all of the field. A buck trippant gu. attired or, holding in the mouth a trefoil slipped vert, and resting the forefoot on an escutcheon of the Burke arms, viz., or, a cross gu. in the 1st quarter a lion ramp. sa. and in the 2nd a hand of the last. A buck (male deer) trippant (standing on 3 legs) gu (gules=red), attired or (gold), holding in the mouth a trefoil (branch with 3 leaves) slipped (like a slip from a plant) vert (green), and resting the forefoot on an escutcheon of the Burke arms, viz. (abbreviation for videlicet, which is Latin for "it is easy to see"), or (gold), a cross gu (red) in the 1st quarter a lion ramp. (rampant = standing on one hind leg, while pawing the air with the other three) sa. (sable=black) and in the 2nd a hand of the last. It was a little difficult to get a good exposure due to the reflective nature of the material used to create the artwork. You can see that it has some of the same elements as the other two coats of arms. 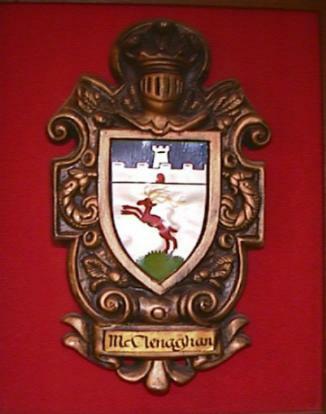 There was no source material provided with this, so it is unknown from what description this coat of arms was created.